In 1969, the shelter moved to its current location at 5278 E. 21st Street in a quiet residential neighbourhood, located just off of 22nd and Magnolia (near Thoroughbred Nissan.) The shelter is home to about 200 cats, including some permanent residents with special needs such as GI issues, allergies, or timidity. Some of the adoptable candidates include cats with FIV, and diabetes. The shelter has undergone major renovations under the leadership of the new executive director, Joe Sprague. 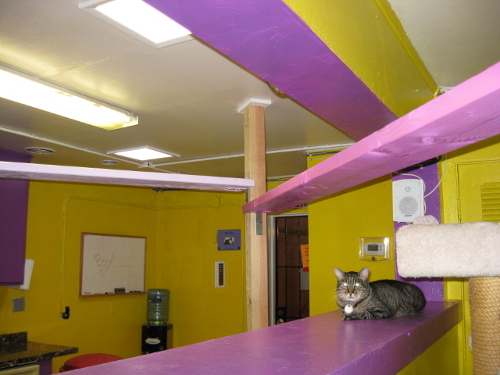 The shelter now includes a new adoption area, fresh paint, a modernized computer network infrastructure, air conditioning, and cat walks though out the shelter. The Hermitage will be hosting movie nites at the shelter, The first movie: Mama Mia (a sing along) on Thursday, September 12 starting at 6:30 pm. The cost is $5. A pass for $25.00 is available to view 6 movies of your choice! Gun control is a lightning rod for divisive politics and rhetoric. On the eve of the 2nd anniversary of the Tucson shootings on January 8, 2011, one thing is abundantly clear: nothing has changed. This time around: mass slayings in Colorado and Connecticut. People are still free to exercise their civil liberties and own, hunt, and sport shoot. What is also clear is that guns are still ending up in the hands of wrong people. The lessons proffered from the Tucson shootings, have steadfastly been rejected. A few months ago in July 2012, a lone gunman killed 12 people, and injured 58, at a theater in Aurora, Colorado. Just a few weeks before Christmas, 26 people were killed at an elementary school, in Newtown, Connecticut. Those that advocate gun ownership as a civil liberty, balked when their names were published in a local newspaper. Why? It is okay to own a gun, but NOT okay to exercise first amendment rights of Freedom of the Press to print public information. Why? The assault weapons ban sunset in 2004 allowed the sale, use, and importation of high capacity gun magazine clips. Why? I am of the opinion that if a hunter needs more then 3 shots to kill an animal, I am not sure if a high capacity magazine will help. Or is that these high capacity magazines exist for another reason other then hunting. I wonder? What is needed is a clear definition of what constitutes an assault weapon. Requiring assault style weapons like the AR-15, to be ONLY at a range, would be a start. Gun buy backs are another contentious issues. On the 2nd anniversary, Tucson will offer a gun buy back programme. Anyone can turn in a gun, and receive a gift card. Gun control advocates hail this as an attempt to deal with some of the issues. National Rifle Association Members incessantly decry this attempt as somehow removing their civil liberty to gun ownership. Why? Recently I walked into a local grocery store. In the space of 20 minutes, 3 people carrying guns walked into the same store. I left my shopping cart where it was, and quickly walked out of the store. Why is it necessary to carry a handgun into a grocery store? Better access to mental health is also a tantamount issue. 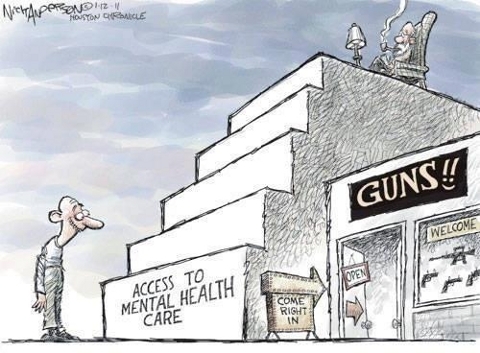 Why is it easier to purchase a gun, then to access mental health care? Lack of access to mental health was a factor in the Tucson and Colorado shootings. It is unknown at this time, if this is an issue in the Connecticut shootings. Amidst a backdrop of monsoon weather today in Tucson, it would seem that is NOT the only thing storming in the Old Pueblo. 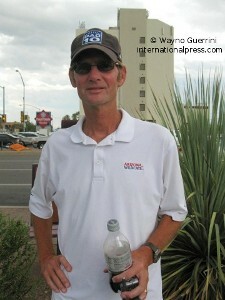 A handful of protesters gathered at the busy intersection of Campbell and Speedway, (near the University of Arizona’s University Medical Centre) to protest the Pima County Republican Party’s decision to raffle a Glock handgun, similar to what accused Tucson Shooter Jared Loughner used on January 8, 2011. Loughner’s is accused of killing 6 people and injuring 13 others that day, including 8th CD, U.S. Congresswoman Gabrielle Giffords (D). 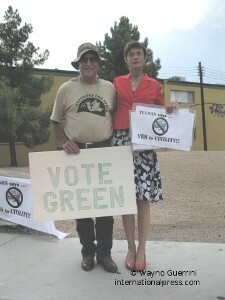 A surprise to many, was Ward 6 Tucson Councilman Steve Kozachik (R). Kozachik, himself a Republican, came out in support of the rally. He is the other side of the Republican party that does NOT agree with the raffle. 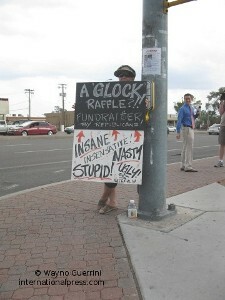 I interviewed Susan Thorpe, one of the protesters and she had this to say: “Raffling off a Glock as a fund raiser? I mean what an outrageous act to do. Why would you raffle off a Glock? Why would you choose to promote violence?” Calls to the Republican Party Headquarters in Tucson, remain un-answered. It would seem that no one in the Pima County Republican Party wants to own this. 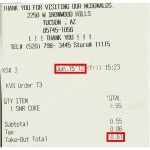 There is much conjecture and speculation, why this was done. Councilman Kozachik said: “Why not raffle off an ipad?” The already splintered Republican party, heads into the Novemeber elections, in just a few short weeks.